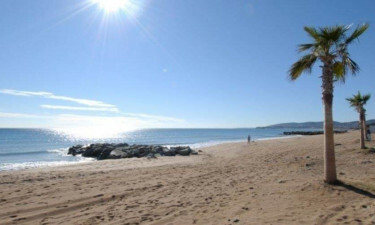 Camping La Barque is a luxury camping site located a stone's throw from world-famous resort towns like Saint Raphel, Saint Tropez, and Cannes. Here, comfort, relaxation, and plenty of opportunities for discovery come together taking luxury camping to a new level. The French Riviera is one of the most sought-after holiday destinations in Europe. If visiting this part of France has always been in your bucket list, LuxCamp can help make your dream come true. Book your mobile home holiday at this luxury camping site with LuxCamp, the camping luxury experts. 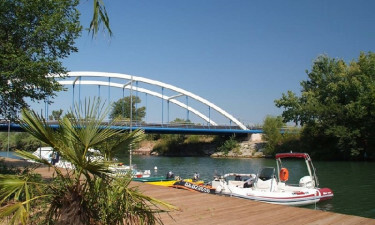 Why choose Camping La Barque? 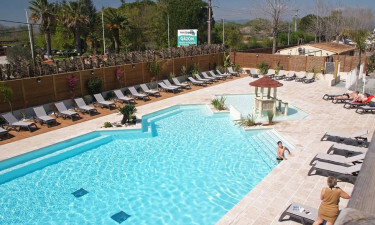 Camping La Barque has an outdoor swimming pool area equipped with sun loungers. Children will love the paddling pool with slides, which is within easy reach of the main pool so you can always keep an eye on them. In high season, you can start your day with a morning aquagym session, or go for a beach walk at the nearby beaches of Argens and Aygule any time of the year. At Camping La Barque, you'll never run out of exciting things to do: you can have a go at ping pong, cycling, volleyball, fishing, and even petanque, just like the locals do. The campsite's entertainment programme features live music, themed evenings, and much more. And to end your evening, you can chill out and enjoy the breeze at the onsite bar and restaurant, which overlook the pool area.